Did you know that the pawpaw is the largest edible fruit indigenous to North America? We had spent hours walking around the main market area between the ferry building and the bay, then discovered another long row of produce vendors on the other side of the building. At the very end of our Ferry Plaza Farmers Market expedition, we came across a vendor with just a few pawpaw fruit left. Had heard of them, but never encountered them in real life. I was utterly exhausted at this point, but so very excited at this new discovery! The literature on the table said they are a relative of cherimoya (easily in my top 3 favorite fruits). 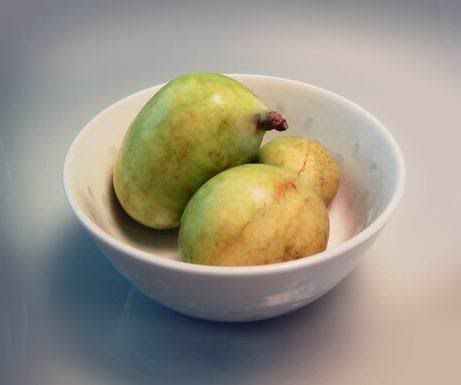 According to Wikipedia, the pawpaw hasn’t been cultivated to the extent of apples and peaches because it doesn’t ship or store well. It is a delicate, easily bruised fruit. Pawpaw shrubs are relatively low maintenance, and since they have few pests, are easy to grow organically. Like cherimoya, each pawpaw fruit has a few large dark seeds. The one I tasted had a fragrant tropical smell, a little like cherimoya and papaya. The texture is incredibly creamy. They are higher in protein than most fruits, and must have some of the good fats avocados have, because of the similar texture. I wouldn’t say it was THE BEST fruit I’ve ever tasted, but I’ve had some mediocre cherimoyas too. Reviewing your first experience of something is a bit dicey. On the one hand, it’s totally new, so I can speak about it without any preconceived ideas of the “other pawpaw I ate last week”. On the other hand, I may have eaten the only mediocre pawpaw in existence and it doesn’t come close to representing the full flavor of it’s brethren. 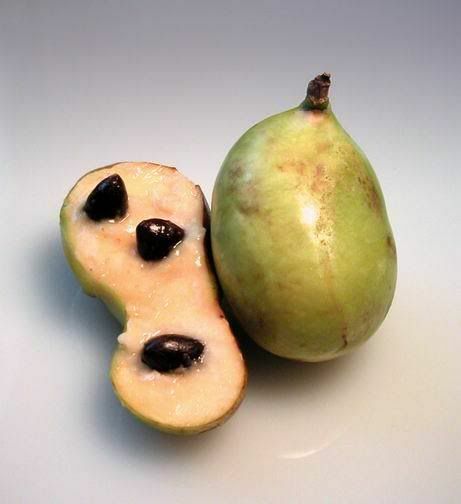 So, for now, since September and October are pawpaw season, I suggest you seek them out and have your own experience of this taste of the tropics, native to our neck of the woods. I’ve never had one of these! I’ll look out for them, sometimes they have odd things at the supermarket – you never know what they are! And those 3 black things are the stones? Wow! It is exciting to discover new foods. Nicisme – Great to hear from you. I enjoy your blog. It’s true, there are so many wondrous fruits and veggies. Kristen – You are welcome. I love discovering a “new to me” fun food. Such a treat. Jason – Thanks so much for all the info. I will follow up on the links you gave. I’m such a food geek, the idea of a whole radio episode dedicated to pawpaws and persimmons sounds like heaven. I am so pleased to FINALLY find out what that yummy fruit growing in my backyard is. The texture and flavor on this fruit are indescribeable! Please find a Paw Paw tree and plant it in your back yard! jt – So glad to be of service. Now you know. I hope I am fortunate enough to have a pawpaw tree in my yard at some point. Paw paws have been studied at Purdue University in a search for an organic pesticide that repels insects and for their ability to bolster the immune system in the struggle against AIDS and cancer. I researched them for a menu highlighting native Indiana foods. The dish I crafted was a Persimmon Spice Cake with Paw Paw Ice Cream Charlotte. Sadly/happily, I never got to eat one because of the birth of my first child! I’m told it was very good. This is giving me the impetus to do it at home for my family. Thanks! Sean – Thanks so much for throwing in your two cents about your experience with pawpaws. Your persimmon spice cake with pawpaw ice cream sounds scrumptious! I’d love the recipe if you’d be willing to share. Yes, the birth of ones first child does trump cake, no matter how good. Paw Paws are actually pretty easy to grow (here in Michigan, anyway) and provide a beautiful, straight tree with large leaves (reminds me of chesnut leaves). They are best when fully ripe (they’ll be soft like ripe avacados), smell like a cross between papaya and cheese, and taste like a cross between a banana and vanilla custard with a wonderful custard texture. The icecream idea sounds incredible. My kids like them mixed with yogurt, or mashed and served as a spread on nut bread. I just like to slice them and scoop the fruit with a spoon. Yum! They are delicious, my father grew them here in San Jose, California for many years. I plan to keep his tree. Hi Larry ~ This article was written by my daughter-in-law Briana. Since she purchased them from a farm market vendor, I have to assume he knew what he was selling…though perhaps not? I’m Briana’s mother-in-law (the current author of FigsWithBri, since her death almost six years ago). I haven’t tasted pawpaws though I’ve been curious about them. Can you tell us more? How big is the tree you have? What does your tree’s fruit look like? Do you have photos? Do you only eat the pawpaws fresh or can you cook with them? Thanks for stopping by to comment! than the ones that we usually encounter in my part of the south SF bay area. My dad planted a popular type of Pawpaw, a member of the Asimina triloba species. On the varieties within that species, I don’t know exactly which one, but I think I can find out from looking at his notes and papers. If you search on the web for that species, you will see many, many beautiful images of the fruit and leaves on the tree. Here is an article on the web, if you see the picture in this article, ours are smaller than these fruit, probably since the tree is less large/mature, but otherwise similar. Someone posted a really nice set of pictures, from their patch, here. You can see how the flowers and fruit grow there. Larry ~ Thanks for those info links. Interesting how the San Jose area is suited to Pawpaws as compared to SF. Wonder if they would grow up in Santa Rosa where we are or if a bit further north in Cloverdale would be better? I’ll contact the rare fruit growers group and ask. Those flower photos are interesting. Fetid aromas are not exactly what folks like to smell! How stinky is your Dad’s tree and how long does it stay in blossom? I believe these aromas are detectable mostly to insects. It does not stink. I believe that the blossoms are there for a few weeks. I believe that the tree does fine in places which have cold winter and warm/hot summer, but you are not supposed to have it exposed to a lot of windiness. As has been described before, when raising trees from seedlings or small size, you need to have another plant or tree sheltering it from above.